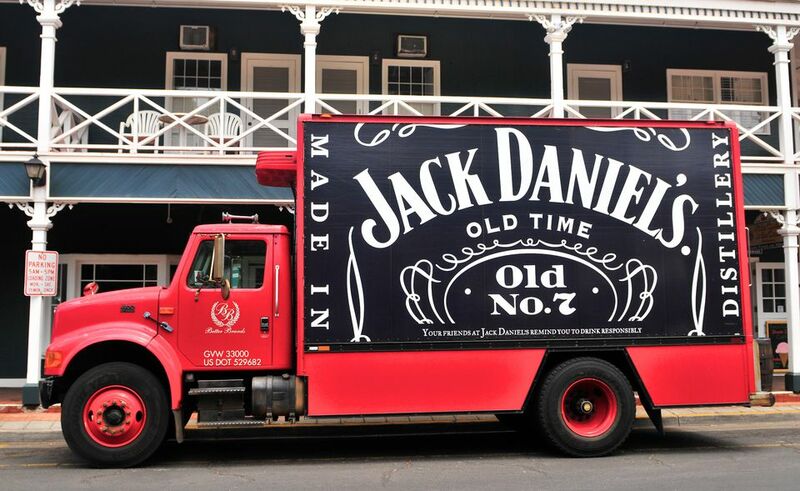 Let's talk Jack, as in Jack Daniel's Tennessee Whiskey and the Jack Daniel's Distillery. Let's talk about the town of Lynchburg, Tennessee, too, because you really can't have one without the other. Sure, other companies make whiskey, but making Tennessee whiskey is pretty unique in itself, and the production is one the folks at Lynchburg have mastered. Some say the taste of Jack Daniel's Tennessee Whiskey comes from the local, iron-free waters and hard sugar maple charcoal filtering. But once you've visited Lynchburg, you will know that there's another special ingredient in every bottle of this Southern whiskey. It's the love of the Lynchburg residents. The town of Lynchburg and its residents are so intertwined with the Jack Daniel's Distillery that it's commonplace for families to have a history of several generations of ancestors who have worked at the distillery. It's become a family tradition in this part of Tennessee. The population of Lynchburg is less than 500, usually around 350. And Moore County, the smallest county in Tennessee, has a population just under 6,000. Overall, Lynchburg is a small, quaint, slow-paced town that offers a ton of Southern hospitality. Lynchburg is a one-stoplight town, and that's part of its charm. You will find an example of a Tennessee historic town square and a 100-year-old courthouse in the middle of town, which provides visitors with an afternoon of antique shopping, country dining, and relaxation. The Jack Daniel's Distillery is the oldest registered distillery in the United States but ironically, Moore County is a still a dry county, which means that no alcoholic beverages are allowed to be sold here. So you won't find any bars in town selling alcoholic drinks, and this includes the hometown favorite. Still, visitors to Lynchburg can find and buy plenty of other great goodies, from candy to cakes, made with hints of Jack Daniel's Whiskey. If you want to get your hands on a bottle Jack Daniel's Whiskey when visiting Lynchburg, the distillery tours currently do allow visitors (only) to purchase bottles of whiskey on-site to take home with them. Tours of the Jack Daniel's Distillery are free. The distillery walking tour takes about one hour to complete and is offered every day except on Thanksgiving, Christmas Eve, Christmas, New Year's Eve, and New Year's Day. The Jack Daniel's Distillery and Lynchburg are just over an hour's drive south of Nashville. If you don't feel like driving, there are tour bus companies in Nashville that offer seasonal tours several times a week to the distillery. If you plan on staying a few days to explore Lynchburg, there are numerous overnight accommodations nearby, including hotels and bed-and-breakfasts. Most require reservations. Jack Daniel was a real person. Jasper Newton Daniel stood just over five feet tall and began making whiskey at the ripe age of 13 for a Lutheran minister. Daniel died of gangrene, after kicking his safe, on October 10, 1911. No one knows his actual birth date, but locals celebrate it every year in September. Jack Daniel didn't have any children so the distillery was passed down to his nephew, Lem Motlow, whose name still appears on the Jack Daniel's Whiskey labels. Jack Daniel's Whiskey is 40 percent alcohol by volume and 80 proof. While Old No. 7 is situated prominently on the Jack Daniel's Whiskey label, no one has a clue as to what it really means. There are several different legends that surround the history of Old No. 7, from it being a batch number that Jack Daniel used, a train number that the whiskey was shipped on, to just a lucky number that he chose. The recipe for Jack Daniel's is a really big secret, but we do know that the main ingredients include corn, rye, barley, malt and, of course, the special cave waters. The distillery also uses a hard maple charcoal filtering system and stores the whiskey in charred white oak barrels.